Regime Detection comes handy when you are trying to decide which strategy to deploy. For example there are periods (regimes) when Trend Following strategies work better and there are periods when Mean Reversion strategies work better. Today I want to show you one way to detect market Regimes. To detect market Regimes, I will fit a Hidden Markov Regime Switching Model on the set of simulated data (i.e. 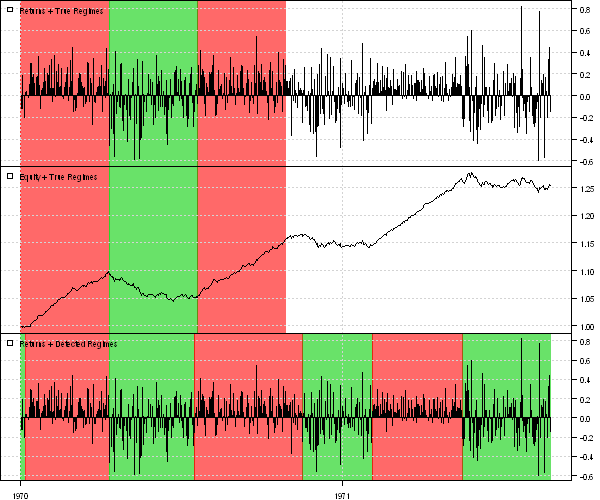 Bull / Bear market environments) I will use the excellent example from the Markov Regime Switching Models in MATLAB post and adapt it to R.
The idea behind using the Regime Switching Models to identify market states is that market returns might have been drawn from 2 or more distinct distributions. As a base case, for example, we may suppose that market returns are samples from one normal distribution N(mu, sigma) i.e. Next we may suppose that market returns are samples from two normal distributions (i.e. returns during Bull market may be ~ N(mu.Bull, sigma.Bull) and returns during Bear market may be N(mu.Bear , sigma.Bear) i.e. Fortunately we do not have to fit regimes by hand, there is the RHmm package for Hidden Markov Models at CRAN that uses the Baum-Welch algorithm to fit Hidden Markov Models. Next, let follow the steps from the Markov Regime Switching Models in MATLAB post. 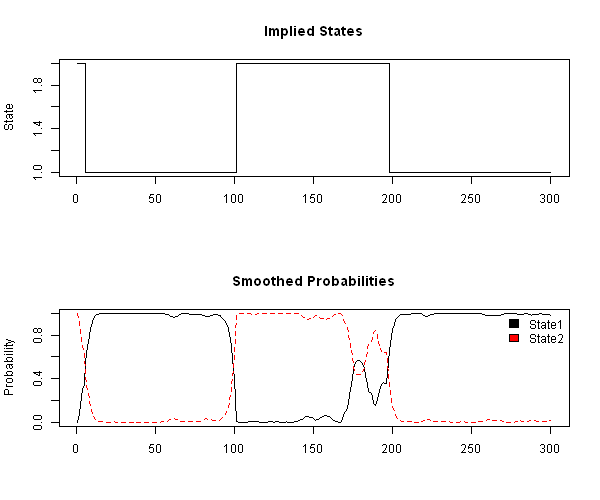 The first chart shows states (1/2) determined by the model. The second chart shows the probability of being in each state. The first 300 observations were used to calibrate this model, the next 300 observations were used to see how the model can describe the new infromation. This model does relatively well in our toy example. To view the complete source code for this example, please have a look at the bt.regime.detection.test() function in bt.test.r at github. Very nice example, in which you define a two-regime switching, is there a way to detect the number of regimes for given data. Thanks as usual. I think you can try mixture of distributions approach to try to partition your data. Otherwise you will have to specify desired number of states apriori. Excellent how Markov process is quickly modeled in R. I hope you’ll expand on this by taking a real example, e.g. SPY or ^GSPC. We already know that returns are generally not normal but would be interesting to look at the output. Is there any out sample testing about this? The more appropriate question to ask is how can you know which regime you are currently in right now and whehter a shift is coming? Copyright Systematic Investor © 2012. All rights reserved.